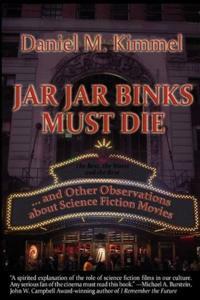 Despite what the title might lead you to believe, Jar Jar Binks Must Die is not about the populist Internet reaction to what is probably George Lucas’ most reviled character or even about Star Wars as such . . . Unlike many other film critics Kimmel is actually a fan of sci-fi movies. His pet peeve is people who disrespect the genre and believe that if a movie or book such as 2001: A Space Odyssey or Time Traveler’s Wife is good, then it can’t be science fiction because all science fiction is junk after all! We share his frustration at sci-fi’s ghetto status amongst “serious” cultural commentators and non-fans, but within the context of this compilation it comes across as preaching to the converted. Huge chunks of the book are dedicated to this theme and it gets slightly repetitive at times. The essays deal with anything from the restored Metropolis (1927) print to which post-Star Wars science fiction movies are in the running to be “canon”; why 2009 was a bumper year for the genre thanks to the likes of District 9, Star Trek and Avatar; how Kimmel’s opinion on Spielberg’s E.T. changed when he saw again the movie a few years after its initial release; why remakes aren’t necessarily a bad thing; and so on. Even when you find yourself not agreeing with Kimmel – his take on E.T. is just plain wrong damn it! – the book remains worthwhile and thought-provoking. Kimmel’s stated aim was to introduce the reader to new movies or even make him or her want to rewatch some old ones, and at this he succeeds well. If you, like Mr. Kimmel, also frequently check out the pages of this site, then Jar Jar Binks Must Die is worth a purchase.